Along Rua das Pedras – and also in Orla Bardot – there is a surprising variety of shops and buying something is inevitable. To make a splash at night or at the beach, let yourself be hypnotized by the windows of the designer shops, which will entice you with outfits and accessories that carry the charm of Búzios. Household items are also a hit. 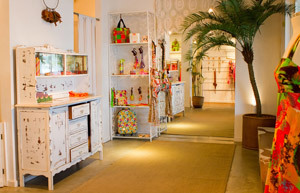 Pieces produced in the region and in other corners of Brazil and the world stand out in the décor shops. The glamour of the shop windows adds even more charm to Rua das Pedras. Shopping in stores like Richards, Farm, Cantão, Osklen, Animale, Wöllner, Redley... is always a pleasure, especially away from the stress of shopping malls and traffic. At Travessa dos Arcos, two parallel galleries that form a square featuring a café and fountain, you will find some of the major international brands that have arrived in Búzios, such as Vuarnet and Lacoste. Swimwear is the focus of many addresses. Besides the latest in bikinis, they also offer trunks, beachwear, shorts, sandals and accessories. The infinity of colors, designs and styles makes women ecstatic. Somewhat tucked away and full of hidden pearls is the Passeio das Palmeiras, in front of Cine Bardot, on the Travessa dos Pescadores. There, surf wear shops like Bintang rule. Besides trendy fashion for both men and women and accessories, you will find books, CD’s and home furnishings made in Búzios, Hawaii and Jamaica. The pleasant atmosphere of the Passeio das Palmeiras also houses a café with outdoor tables. It’s also worth checking out what’s new at the crafts fair at Santos Dumont square. The tents are set up at night and it’s possible to find jewelry, paintings, tapestries… all in a multitude of colors! Sophisticated pieces to decorate the house are also featured along Rua das Pedras and its galleries. Among the more traditional shops is Âmbar, with pieces from various corners of the world – from Chinese china to Indian tapestry, Nepalese jewelry and beautiful Turkish ceramics. The pieces for sale are acquired during the owner’s travels. The objects come from India, Morocco, Bali, Africa and Ivory Coast. In addition to decorative pieces, such as tablecloths, cushion covers, statues of various gods, natural fiber lamps and scented candles, the store also offers jewelry in silver and stones, such as turquoise and amber lapis. Good deals can also be found in Manguinhos, at Avenida José Bento Ribeiro Dantas. At Espaço Domme, a 3,000 square meter décor complex, there are over 50 types of furniture in natural and synthetic fiber. Decorative pieces and tapestries area scattered around five bungalows, along with lakes and gardens. The space also features a Japanese restaurant (Kojiki) and a seafood restaurant (Mare) – where everything is for sale, from the china to the tables and chairs. Next door, at Porto da Barra, home décor shops like Soho, share attention with art galleries and studios that keep the gastronomic space bustling with permanent and temporary exhibits. Art is everywhereBúzios houses studios of local artists and also artists from other states and countries. And there is no shortage of places in which to appreciate paintings, sculptures, tapestries... The addresses are spread throughout various beaches and neighborhoods, but a good part is centered in the vicinity of Rua das Pedras – there, a small space called Galeria das Pedras features various works and permanent exhibits. And even better: the pieces can be admired and taken home! 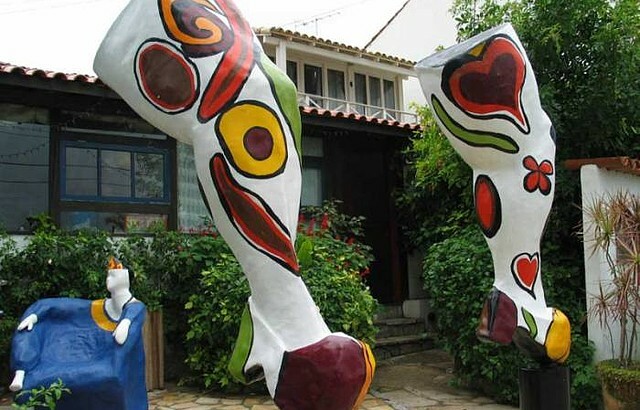 Famous for her colorful and gigantic sculptures, Rio Grande do Sul artist Ivone R hast set up a studio at her home, located at the end of Armação beach. Another artist who has turned his beachfront home into a workplace is Marcelo Moraes, who shows his paintings in acrylic at Baía Formosa. The galleries in Rua das Pedras were the spots chosen by painters Celina Lisboa and Abigail Vasthi Schlemm to show their work.